Tongue Fried Goat: Collect Them All! I have a long history with card games. One of the first card games I played was Dutch Blitz, which I was woefully outmatched at. (It doesn't help when you are the youngest in your family. It also doesn't help when you miscount your pile at the start of the round, don't play any cards in the round, and your family holds you accountable for the twelve cards in your should-be-ten-card pile.) Being the youngest, I often found my way into family games through watching, asking questions, and trying to learn on my own. This is how I learned Pinochle, which remains one of my favorite card games, though I haven't really played since my grandma died in 2007 (and didn't play much after my dad died in 2000). While my sisters were doing other things, I sat at my aunts' table and watched closely as my dad--renowned for his high bids and frequent victories--carefully chose which cards to play. He didn't get to play Pinochle often, so he valued the few opportunities he got to play--namely, when Grandma was around. (Grandma was the only person I knew who had an electronic handheld Pinochle game.) So it was so special to me when Dad scooted his chair over a little bit to allow me a better view of the table and explained in full the rules I had guessed in part. This is one of my favorite memories, because it is one of the first times I felt included in something. After Pinochle I learned Rook (which was played in both my dad's and mom's families); after Rook, Euchre (which always seemed the sickly Eustace to the robust Lucy and Edmund of Pinochle and Rook); and from there, the collectible card games that bled my allowance dry in my adolescence. Collectible card games are card games that are not played with a fixed deck. That is, each player brings to the table a deck that he has built himself before the game begins. The cards for these decks are mostly acquired through starter decks (sample decks designed by the game designer that are functional, but not ideal) and booster packs, which are like baseball or any other kind of trading cards, except that the cards are also functional (part of a game). As you can imagine, this method of deck building can be problematic--but more on this later. 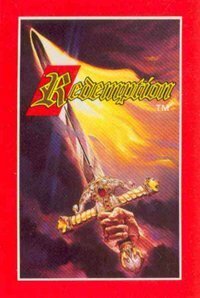 My first foray into CCGs was Redemption, a collectible card game based on the Bible. Redemption, as far as I'm able to discern, was basically created to be a Christian alternative to Magic: The Gathering, which was very popular when Redemption was released. Redemption was played by little boys who would rather be playing Magic, but whose mothers would rather them play a Christian game (even if, as I mentioned elsewhere, this "Christian" game caused many more fights than its secular counterpart). Because of this fact, the art catered to the would-rather-be-playing-Magic crowd. Abstract concepts that were subtle and therefore difficult to portray were often depicted in large scale using dragons. The beasts from Revelation were some of the most powerful--and most sought-after--cards, mostly because they had cooler art than the rest of the cards. What twelve-year-old boy wants a card showing "Faithfulness of Ruth"? Bring on the dragons and the angels! Bring on the swords, the violence! I originally tried playing this game with my sister, but she quickly (and understandably) lost interest. This was shelved for a few years before I revisited it. 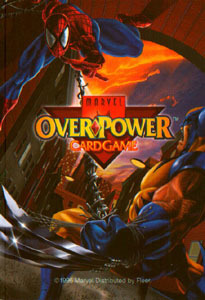 I next tried Overpower, a CCG that depicted Marvel superheroes. I got my first Overpower starter deck for free as a mail-in offer from the back of a cereal box. The game was cumbersome, and the rule book was thick and unwieldy, so my friends and I made up our own rules to this one. It wasn't that great, but we played it like it was. Fast forward a few years to when I started making friends at church. I discovered that my friend owned some Magic: The Gathering cards, and like a good Christian, I converted him to the Christian card game, Redemption. He caught the Redemption bug (plague? ), and we were quickly in a buying war to try to get the best cards (the downfall of CCGs for the consumer; the boon of CCGs to the manufacturer). We played often: at each other's houses, at church, at social events--wherever we could find a flat surface and twenty or so minutes. As I mentioned before, the rules were so poorly written, the cards so unclear, and even the game's goals shrouded in such obscurity that playing probably led us farther away from biblical principles than not playing would have. Our friendship nearly ended at the conclusion of each game. I got tired of frequent tiffs, so at a party, I decided to introduce my friend to the Star Wars CCG, even though he had never seen any of the Star Wars movies, even though we had already invested two or three years' worth of allowances in Redemption cards. We just needed the peace that a game with "war" in the title would bring. Well, Star Wars caught on even more than Redemption, and this was soon the sinkhole of my allowance money. I learned the real rules for this game (as written in the rulebook), so this one didn't generate as many fights. At least, not as many rules-related fights. But adolescent boys will find other things to fight over. This is a representative snapshot of the CCGs I've played. I've also dabbled in Shadowfist, Marvel Vs., Young Jedi, Star Trek, X-Men, Teenage Mutant Ninja Turtles, Pokemon, Mortal Kombat, Lord of the Rings, etc. Yes, I wasted lots of allowance during my adolescent years. Thankfully, through shrewd selling on eBay, I think I recouped the majority of the funds invested. There is much to like about CCGs. First of all, I like that CCGs are customizable, that is, you can make a deck that centers around whatever strategy you choose, and there are probably cards that fit that strategy. The options are limitless. I like the immersive experience of these games, and I also like the practical end of collecting. I collected Spider-man trading cards before this, and while they're cool to look at, they now remain in a binder; there's not much I can do with them. Collecting a CCG is different. The cards you collect have actual value (what collectors/other players will pay for them) and practical value (the function they perform in the game). Of course, the main problem of CCGs is investment. If you want to really have a chance in playing a CCG, you have to buy the cards. Booster packs were typically nine cards and divided in a 1:3:5 ratio, representing rare, uncommon, and common cards, respectively. You can technically play with a deck that includes only a few rare cards, but if you want to win, the best cards are almost all rares. 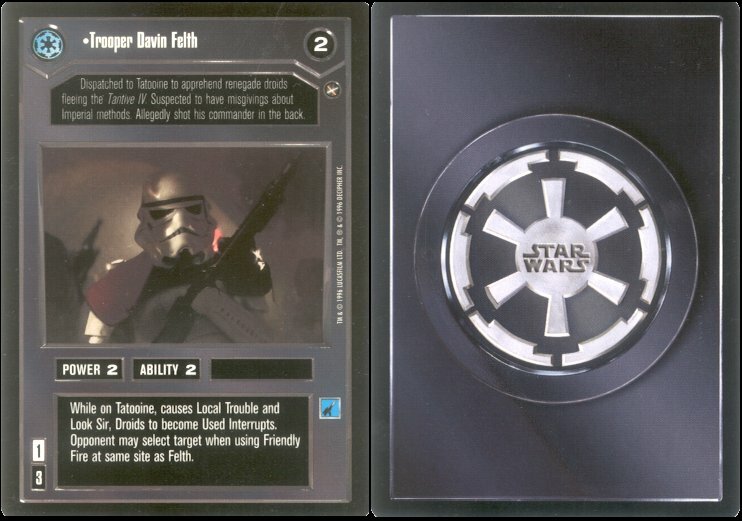 (The rule of thumb in the Star Wars CCG was that if you knew a character's name before playing the card game [e.g., Luke, Chewbacca, Han, Leia, Lando], he was rare.) This means you can either buy up boxes of booster packs (when I played, in the days before Amazon, about $60 a piece) and hopefully draw what you need or you can buy individually the cards you want, which is even more pricey. CCGs strongly favor the player who spends more money, which puts his opponents at a disadvantage. This leads to the second problem: finding people to play. Playing a CCG is not a matter of simply borrowing your friend's cards. Even if your friend is gracious enough to let you use his extra deck (which is not always the case), chances are you won't know how to use it properly. Decks are best played by those who design them. The designer knows which cards to wait for and which to play immediately. Knowing a deck is the first step to proper playing. So you either have to use someone else's deck (which puts you at a disadvantage) or buy into the game (which, unless you have heaps and heaps of cash, also puts you at a disadvantage). And when someone knows he is at a disadvantage from the get-go, he is unlikely to buy in. I remember my dad saying that one of my friends' parents joked to him, "You've gotta stop Jon from introducing [NAME] to all these card games--it's hard to keep up!" I'm sure this was more truthful than I cared to realize at the time. Why talk about CCGs? For that, you'll have to wait for my next post. Hahahaha. I remember you and some others playing Star Wars at quiz meets. I think I even have some photos. I never knew you were a Redemption fan. I'm sure my brother/dad/foster brother would be interested in playing if you were ever stuck in a room with them too long. I'll admit: I collected Barbie cards. Talk about lame. Really, the sentence "Thankfully, through shrewd selling on eBay, I think I recouped the majority of the funds invested" could have ended with "...and then wasted all those recouped funds on video games." Also, I know this post is all a set-up for you to talk about Dominion. If you love Dominion so much, why don't you just MARRY it? Oh right, you're already married to me. Well, that's that. Abby, you're spoiling the surprise! You're right. I could have ended the sentence that way. But I wanted it to end triumphantly, not dismally. I could have ended your sentence with, "but then I sold those video games and bought college textbooks." Yikes, are you guys playing the "Marriage Vs." card game? Complete with "finish the other's sentences" and "I know your secrets" cards. whabam.